Recently I had lots and lots of fun at the Whimsical Christmas wonderland surrounded by breath-taking poinsettia floral town, decorated with ribbons of colorful lights and snowy Christmas tree, festooned with garlands and crystal inspired ornaments and guarded by so many colorful Nutcacker army. Suria KLCC's Centre Court had transformed into a Whimsical Christmas wonderland! OMG! 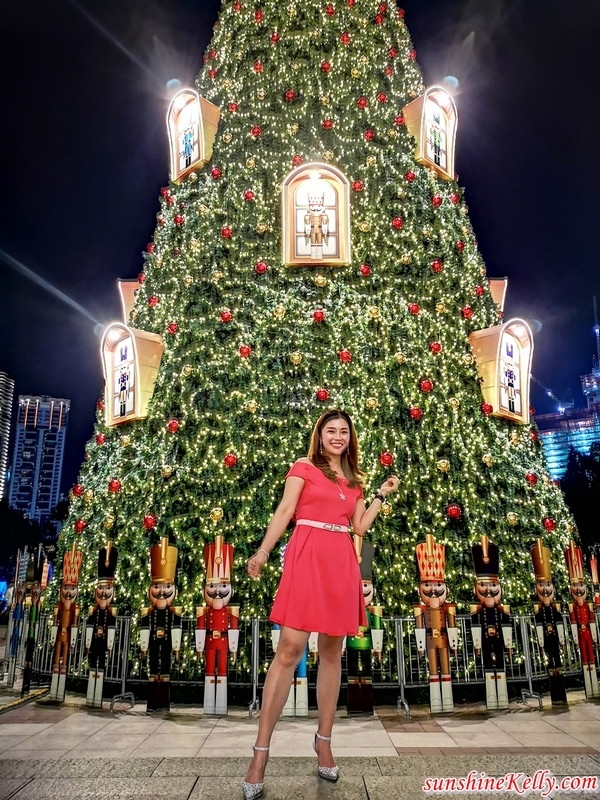 the main highlight is the Malaysia’s Tallest Christmas Tree, guarded by two 15-feet giant Nutcracker Guards at the KLCC Esplanade. I was so mesmerized by this illuminating Christmas Tree. When I looked up and can’t believe my eyes, I almost cried. Then I closed my eyes, make a wish, and smile, hopefully Santa will grant my wish. It’s so magical and beautiful, suddenly I’m so proud of my country, so proud to show Suria KLCC to the world. Words can’t describe my feeling, you have to go there and see it, feel it and capture the moments yourself. The Whimsical Christmas at Suria KLCC was launched by Andrew TAndrew Brien, CEO and Executive Director of Suria KLCC Sdn Bhd; together with Tuan Syed Yahya Syed Othman, Director of Package Development Division, Ministry of Tourism Malaysia; and Puan Norliza Md Zain, Head of Shopping Mall Secretariat, Ministry of Tourism Malaysia. Besides that, there are many insta-worthy spots around Suria KLCC shopping mall that you can stop over and take photos, for example the arch welcoming visitors to Suria KLCC at entrance from KLCC Esplanade and many more. Oh yes!!! 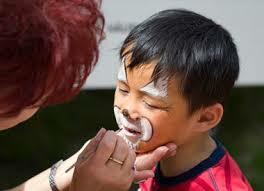 I also list down some of activities that you must not miss out when you are there. So remember to have fun, take lots photos while you shop and be rewarded. Yes! I love to shop and Christmas is the best time to make our shopping more rewarding. 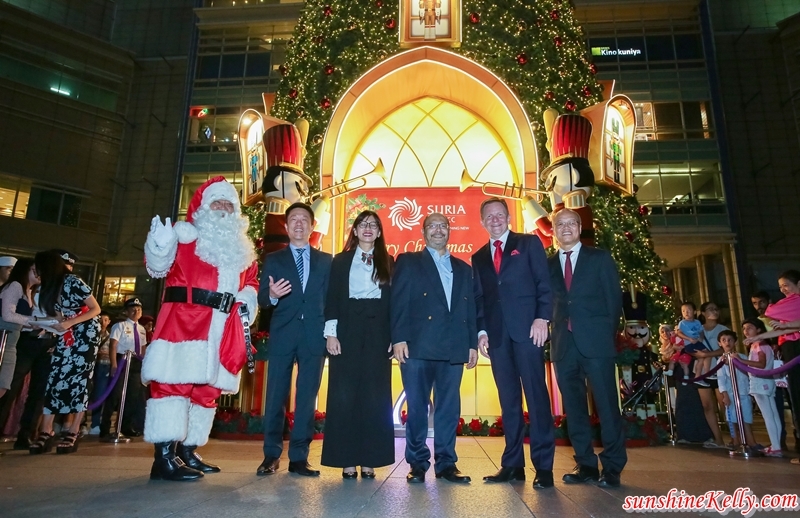 Suria KLCC has partnered with Citibank and De Beers to spread the cheers of giving exclusive rewards. The first 30 Citibank Visa card holders to spend minimum of RM1000 in a single receipt daily will receive a mystery gift and Suria KLCC parking ticket worth RM10. Oh wow! Non-Citibank shoppers will also be able to receive a mystery gift when you spend RM1000 and above in a single receipt. The first 30 Citibank Visa card holders to spend minimum of RM1000 in a single receipt daily will receive a mystery gift and Suria KLCC parking ticket worth RM10. Oh wow! Be sure to head over to the main redemption counter with the Vending Machine at Ground Floor of Suria KLCC in front of O’Brien’s. Aha! 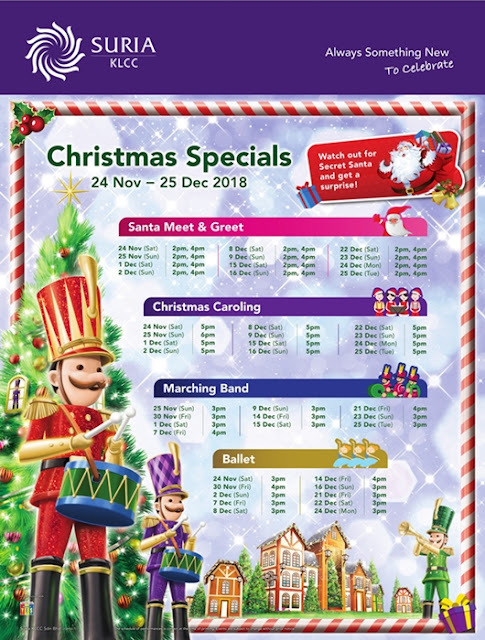 I am sure many children love watch ballet, marching bands, Christmas caroling and more. 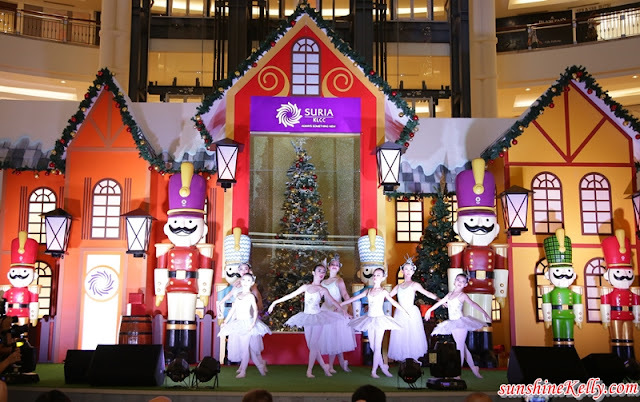 Suria KLCC has prepared a variety of interactive activities and performances throughout the celebration period from now till 2nd Jan, 2019. 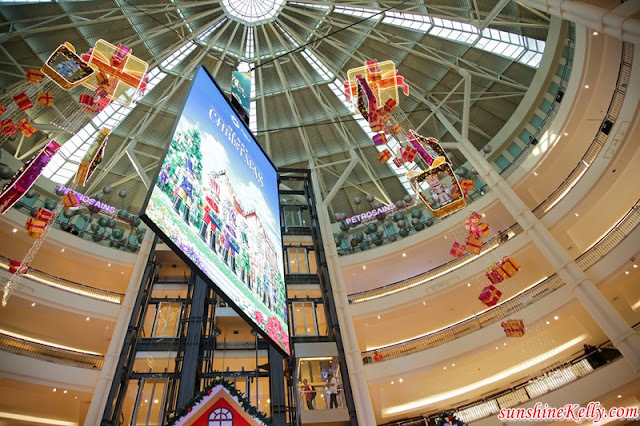 Visitors will get to meet and greet Santa at the Centre Court. Kids will get to take photo with Santa and Santa will give the kids lollipop. 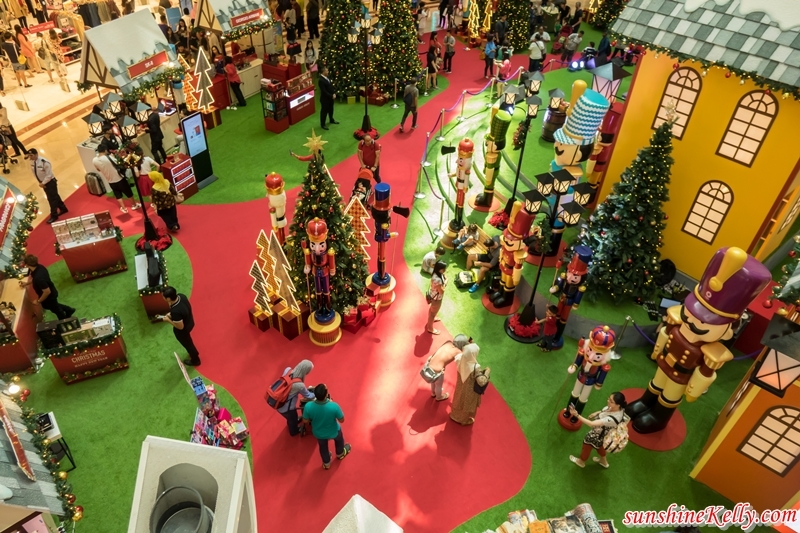 At certain hours, Santa will walk around the mall to interact with children and shoppers on ground. Santa will give the children and shoppers some lollipop to keep them entertained. Visitors will get to be amazed with their jaw-dropping stunts and acrobatics. 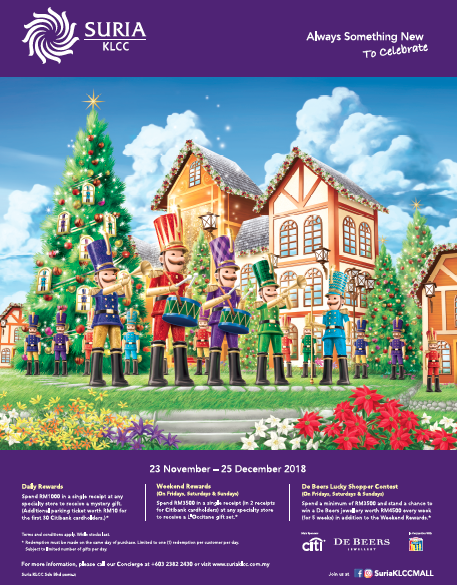 Get amused with all the instrumental synchronizing from the marching band that will be playing Christmas songs. Hey! do remember to check the Christmas Carolling schedule as well as other performances below. Christmas is all about sharing so let’s not forget to share the joy with the less fortunate. Suria KLCC continues to collaborate with Hospis Malaysia in a “Speak Up – There’s an Elephant in the Room” to create awareness and speak public support towards palliative care program. Palliative care is specialized program for people with life-limiting illness and it focuses on improving the quality of life for both the patient and family. If shoppers support by donating RM15 to the campaign and in return they will receive a token from Suria KLCC. Alternatively shoppers may contribute RM15 for their children’s participation in a face and arm painting activities, all proceed will go to Hospis Malaysia. Suria KLCC aim to raise RM10,000 donation collectively from 23rd November 2018 till 2nd January 2019 through direct donation from shoppers. Shoppers that donate RM15 will receive a token of appreciation. Hi Amanda, cepat sebab their Christmas decorations is until 2nd Dec sahaja. Jangan terlepas ya. Hi Tisya, Yeah! memang meriah kat Suria KLCC lebih lagi time cuti sekolah macam ni. I suka ambil gambar buat kenangan. Hi Airah, laa... pergi je la. Boleh naik lrt lagi senang. Yes banyak insta worthy spot yang you boleh upload kat your IG. Hi Emma, yes! musim cuti perayaan macam ni la kita nak ambil gambar banyak-banyak sebagai kenangan. Hi Tengku, Meriah!!! 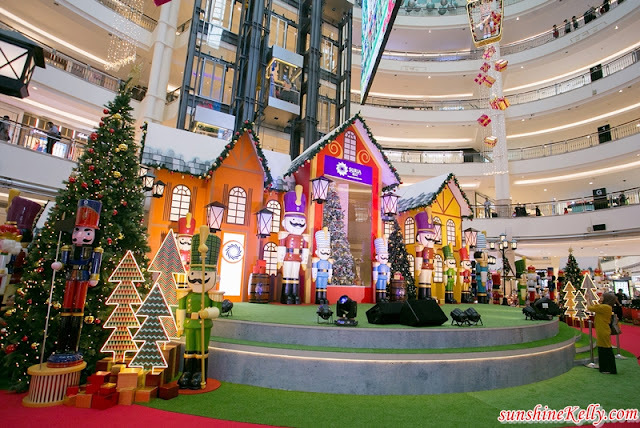 Christmas decor kat Suria KLCC sampai 2nd Jan 2019 tau. Kalau nak pergi cepat ya. Yeah! a great place for photos, shopping and more. Wahhh what a beautiful set up for this year christmas and so many things will happening this month. Hopefully have the opportunity to visit KLCC soon and have fun there. Lucky Citibank card holder can enjoy RM10 free parking right? Hi SHamiera, oh yes! kalau ada Citibank card berbaloi la. Enjoy your shopping and sesi bergambar. Hope to see your postings on your social media tau. Hi Cik Min, thanks and betul puas hati kalau dapat gambar yang cantik with awesome decoration macam ni kan.
Memang cantik sangat.. Best kalau dapat pergi ni.. Sambil2 ambil gambar..cute je tgk children face painting tu.. Bawak budak2 join melukis muka tu mst mereka suka..
Hi Zaza, yes! musim cuti sekolah and perayaan is the time for family bonding and take photos as memories. Hi Maha Mahu, memang cantik and best plus I can't wait to check out their Chinese New Year decor soon. Hi Alia, yes tempat ini macam Whimsical wonderland, best! Hi Hanny, betul. Suria KLCC iconic place of Malaysia so kena la buat perhiasan yang best.